You can print envelopes or documents in a variety of paper types and sizes in the rear paper feed slot. Pull up the paper support for the rear paper feed slot. Flip the feeder guard forward, then slide the edge guides outward. Note: You can load one sheet of binder paper with holes on one of the long edges as shown. Do not select automatic 2-sided printing for this type of paper. 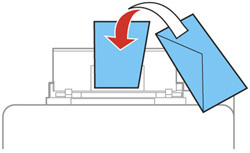 Insert paper, glossy or printable side up and short edge first, in the center of the tray. 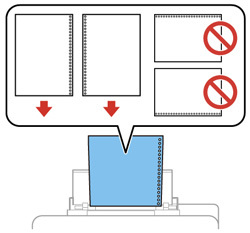 To prevent paper feeding problems, make sure you do not load too much paper in the slot. 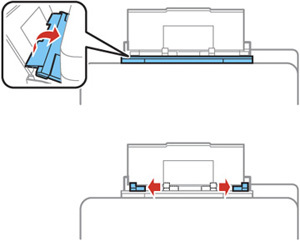 Load envelopes short edge first, with the flap facing down and the flap edge to the left, in the center of the slot. Select the size and type of paper you just loaded in the Paper Setup menu. 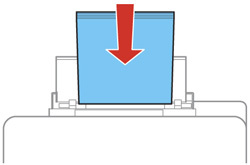 Do not load paper above the arrow mark inside the edge guides.